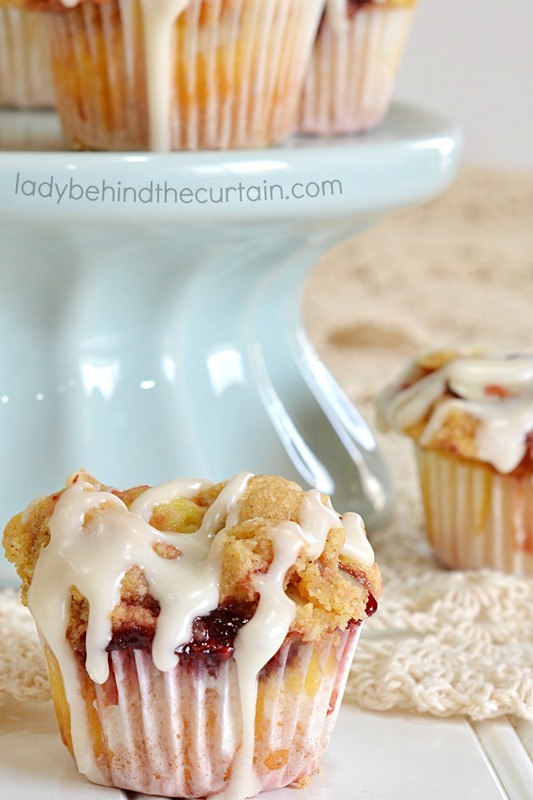 Semi Homemade Raspberry Coffee Cake Mini Muffins | This little twist on a Raspberry Coffee Cake is perfect for a weekend brunch or breakfast buffet. 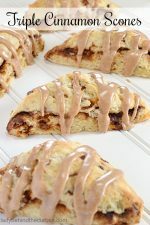 Transform the delicious flavors into mini bites of heaven and wow your guests! 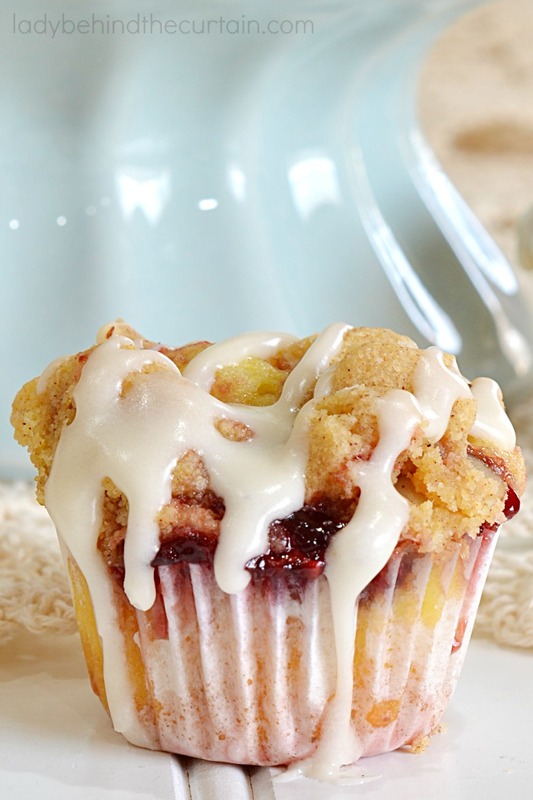 With spots of raspberry jam throughout the muffin, a cinnamon almond streusel and a vanilla glaze you know these Semi Homemade Raspberry Coffee Cake Mini Muffins are a winner. 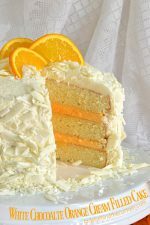 Looking to make a full size cake? Scroll down for how you can skip the mini muffins and make a sheet cake out of this recipe! 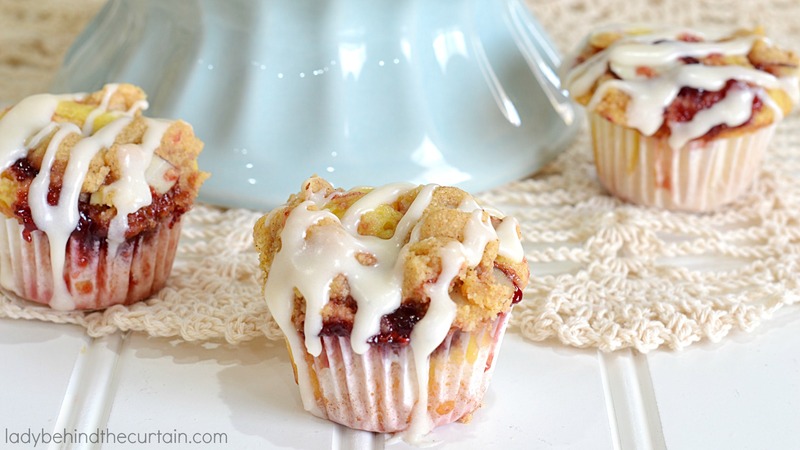 For breakfast, make these mini muffins and for dessert transform the recipe into a cake! Add a dollop of raspberry jam on top of the batter. 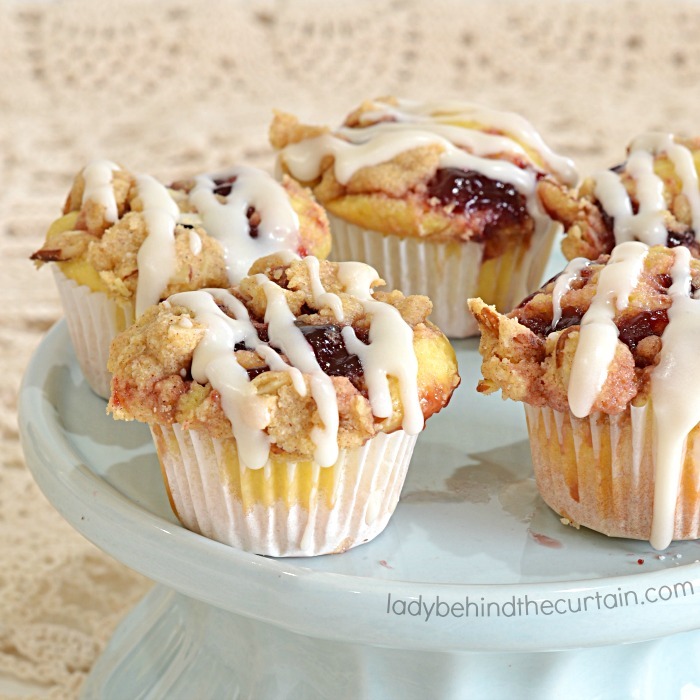 Top the muffin with almond cinnamon streusel. 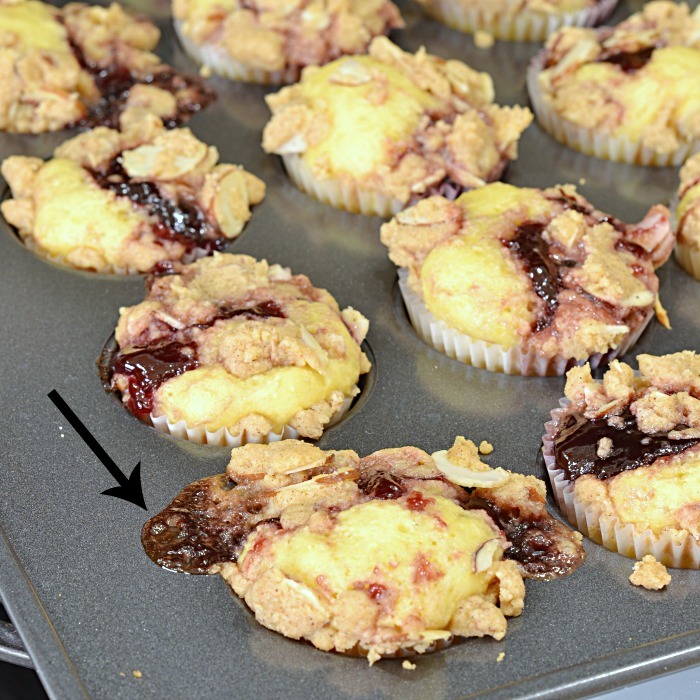 The jam will mix throughout the muffin as it bakes…but it comes out a little messy. 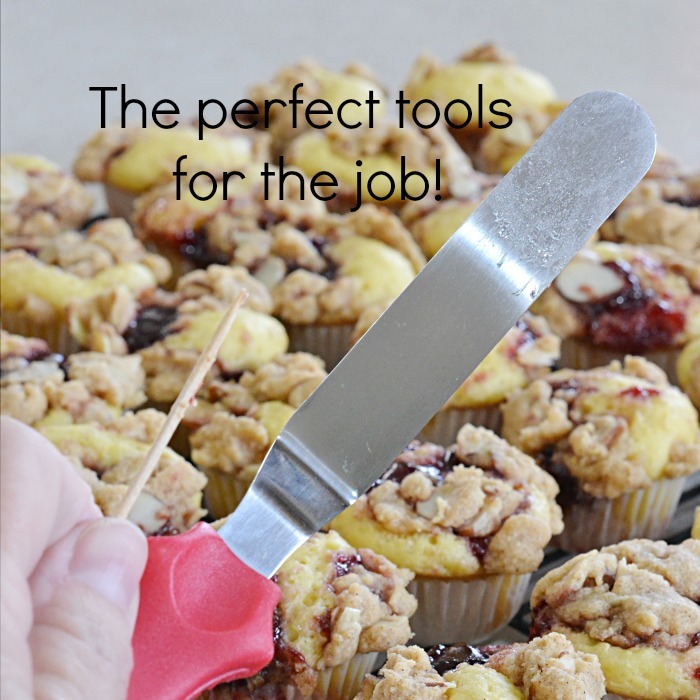 These are the tools I used to clean up the sides and get the muffins out of the pan. All cleaned up and ready for the vanilla galze! Preheat oven to 350°. Line mini muffin cups with 39 liners. In a large bowl combine 1 1/2 cups cake mix, flour, warm water, eggs and yeast. Mix until combined. Fill muffin cups two thirds full. Cover loosely; let stand at room temperature 45 minutes. 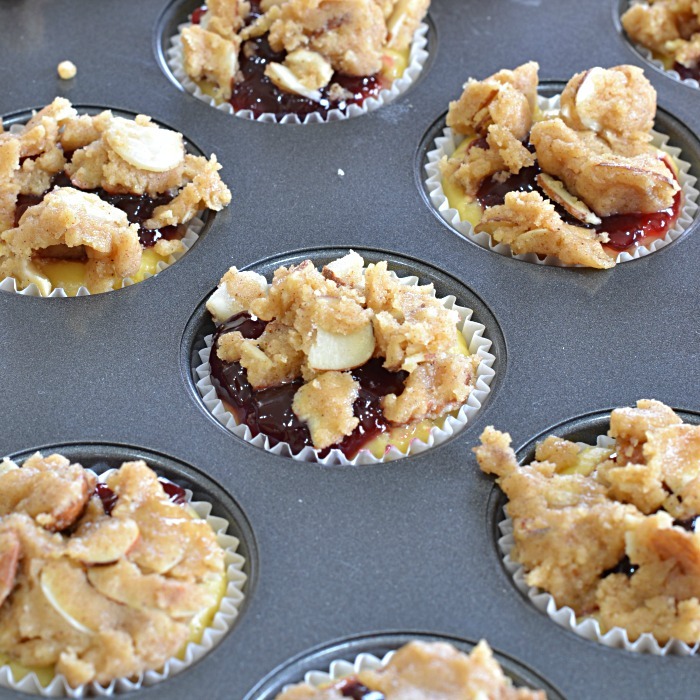 Take off the cover and add 1/2 teaspoon of the raspberry jam and 1 teaspoon of the streusel on top of each muffin. 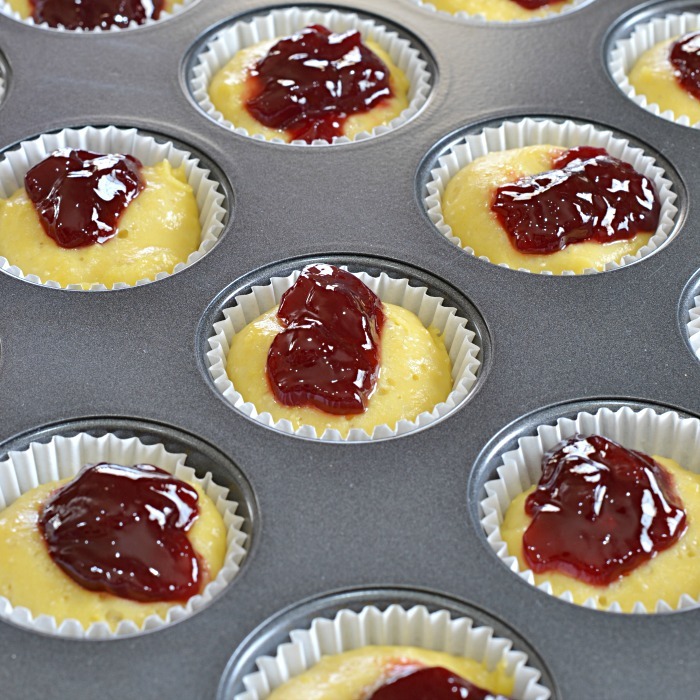 Bake 12 minutes, some of the jam will spread out of the cups, use a knife or offset spatula to push the jam back into the muffin. Continue baking 3 minutes. The edges will be sticky, as soon as you can handle the muffins remove them from the pan. I like to use a toothpick and offset spatula. Cool completely. 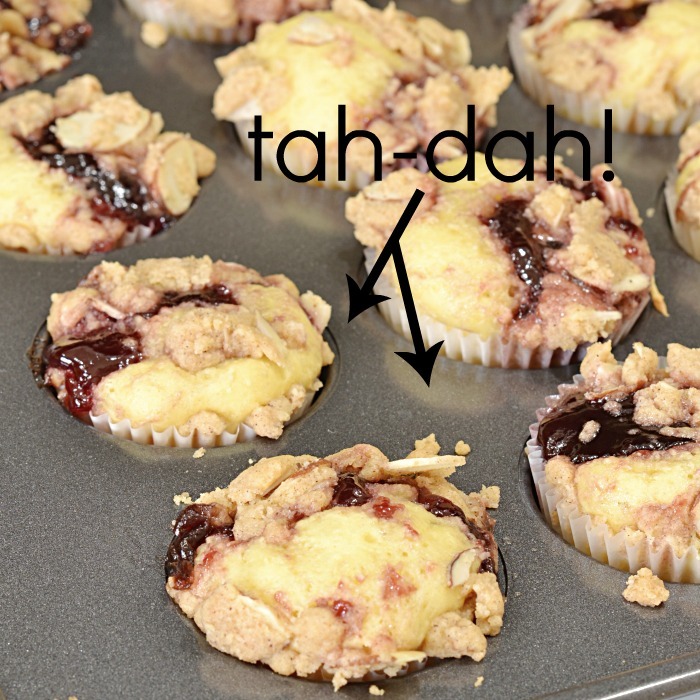 Pour drizzle into a zip top bag, snip the corner, in a back and forth motion add the drizzle to the top of each muffin. To a medium bowl stir together the remaining cake mix, almonds and cinnamon. Pour melted butter over almond mixture; gently stir to combine. 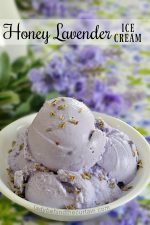 Whisk together the sugar, butter, vanilla and milk until all lumps are gone and has a creamy texture. I made these muffins for a Women’s Spring Brunch. Here is what I served… MINI LEMON POPPY SEED SCONES, MINI CINNAMON ROLLS, MINI APPLE CHEESE BITES, COPYCAT PANERA ORANGE SCONE (mini), APPLE PIE PARFAIT and PEACH COBBLER PARFAIT. We had a great time and the ladies loved all the food! 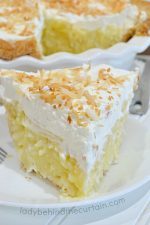 Pour batter into a 9×13-inch baking dish that has been sprayed with non stick cooking spray. Spread evenly. Cover loosely and let stand at room temperature 45 minutes. Spoon jam in small mounds on top of batter. Sprinkle with streusel. 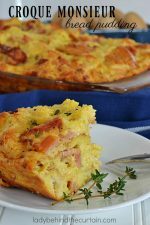 Bake about 35 minutes or until top is golden brown. Cool completely and add vanilla glaze. Serves 12 to 16. 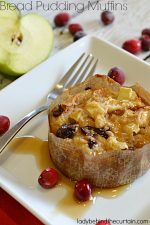 More muffins recipes you might like. 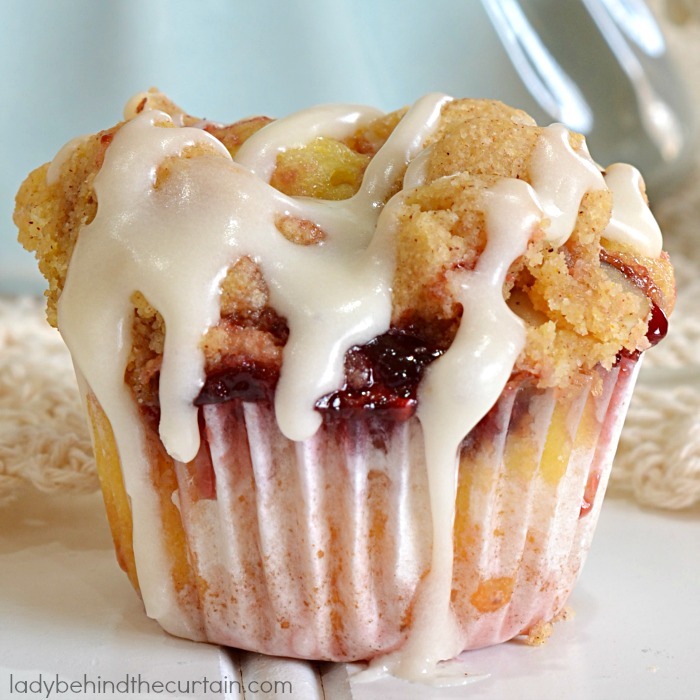 CINNAMON SUGAR MINI MUFFINS and QUICK AND EASY RECIPE FOR MINI BLUEBERRY MUFFINS.